My four year old won't eat meat and never has. How much protein should we make sure he gets daily and should we be giving him a supplement? Thank you for your question. Now that I am a mama its hard for me to wrap my hand around all the fine details of feeding a little one. I am grateful that many of you are asking questions pertaining to children so I can be on top of things not only as a Dietitian but as a mama. Protein is a part of the food that helps our body grow and helps it heal when its sick. Its recommended that 1-3 year old have ~16 grams a day or 1.2 g/kg of body weight and 4-6 year old ~24 grams/day or 1.1 g/kg body weight. To find out exactly how many grams of protein your little guy needs multiply is body weight by 1.1. So how do you get through the day not counting and measuring out every little bite he has to make sure he is getting his protein. Well its easy Eating well with Canada's food guide is designed in a way that if you eat the correct amount of servings for your age and gender you will be meeting all your daily nutrient needs. The two food groups that contain "the most" protein are the milk and alternative group and the meat and alternative group. As long as your little guys consumes two from this list (more can be found at the food guide web site) then he is on the right track. For a four year old boy its recommended that he consume 1 choice from the meat and alternatives. After reading this and you are thinking well I am still not sure if he is getting enough protein here are some ways you can boost that level; without him knowing. Grate cheese into sauces, soups, casseroles, pasta. Add to sandwiches and pour over vegetables. Serve boiled eggs as a snack or serve an egg breakfast once a week. Nuts and seeds: Use in baked goods, stirfrys, salads, and trail mix. Place bread slice on cutting board. Place one cheese slice on bread, top with fruit slices and then the other piece of bread, then spread outside of sandwich lightly with margarine on both sides. Preheat a nonstick skillet over medium heat, add sandwich, cover and cook for 3 minutes or until underside becomes golden brown. With a spatula, turn sandwich over and cook until second side is browned and cheese starts to melt. 1 sandwich contains 16.4 g protein. Last weeks menu went great. Hubby is getting involved in the process adding one of his favorite meals each week. It really helps to have him involved...it kind of lightens the blow when I try some crazy recipe out! The recipe he choice for this past week was chicken and peaches. A recipe that I had never made before. This recipe was pretty simple. You can use whatever kind of chicken you would like. I used the chicken legs. First mix together flour, paprika, garlic powder, onion powder, basil, oregano, salt and pepper (you can add whatever spices you like). Take the chicken and dip it into evaporated milk then dip in flour mixture. Well you are dipping and coating the chicken. Have oven preheating to 350. In the oven place your dish which you will put the chicken into (you want to make sure that it all lays flat in one layer) and add about 1/2 cup of margarine. When you finish coating the chicken bake it for 20 minutes on one side, flip and bake for another 20 minutes. After the 40 minutes drain off all grease and add peaches (you don't want to add the juice because you want the chicken to be crispy.) Bake for another 20 minutes in 400 oven. I served this delicious chicken with long grain rice and a nice salad. One thing I love to do with salad is I wash a lot of lettuce at once. Then I use things that don't go bad in a salad if we don't eat the whole thing. Stuff like peppers and carrots. The salad bowl goes in the center of the table and all around it are all my lovely reused glass jars that have salad toppings in them. Things like raisins, craisins, pumpkin seeds, sunflower seeds, soy nuts and of course dressings. Other things I like to put out are shredded cheese and tomato slices. This is a great "salad bar" for our family and if we don't eat the salad then it can go in the fridge and be used for lunches or the next nights supper. Recently the babe and I went apple picking with our mothers club. It was a lot of fun and I ended up getting a lot of apples. I picked 21.5 lbs!!! I really wanted to make my own apple sauce for the babe, pies and crisp. I have been having so much fun baking up a storm. First I made two batches of apple sauce; the first batch I decided to do on the stove top...well I ended up having the burner on WAY to high and I had a good two inches of burnt apples at the bottom. Sorry I didn't get a picture as I was freaking out about my good pot looking like that! But luckily my good friend Niki just did a post on how to clean your pots when they get like that!! So before I got even get the camera I had dumped a bunch of baking soda in the pot, used my vinegar and water sprayer to spray in some of that and filled it up with hot water. Placed it on the stove to boil for about 10 minutes before I used a scrub brush to simply wipe away the black stuff. I did have to take an SOS pad to it to get the very bottom of the black stuff but it saved my pot. Thanks Niki. So for the second batch of apple sauce I used my crock pot, which was the way I should have went in the first place. It seems this little guys are getting a lot of attention in the apple sauce making business. I have had some friends and family members give me their greatest crock pot recipes. There are lots of variations you can use but since this pot was for the babe I simple just stuck to apples, cinnamon and nutmeg. Other ingredients that could have been used are orange juice and vanilla. For the recipe I place just enough water to cover the bottom of the crock pot. As I was cutting up the apples I had it on high. As you can see from the picture I cut the apples in big chucks instead of small pieces. Thats because I have a hand mixer which I always use to puree my apples when they are really soft and tender to make a creamy apple sauce. When the crock pot was filled with the apples I put in some of the spices, placed the lid on and let it cook on high for about 2 to 3 hours. When the apples were good and tender I took the hand mixer to it. Once cooled I placed it into a old apple sauce jar and now it sits in the fridge ready for the babe to eat it. I will continue to make apple sauce and freeze it in Ziploc baggies for the baby. So now looking at all the peelings, cores and seeds in my kitchen I think to myself there must be something you can do with these things. Of course there is and once again Niki has already done a post on it. Your great girl. However instead of making apple jelly from it I decided to make my own apple juice!! I decided to can it and use it for my homemade apple cider recipe this winter. So I gathered up all the left overs and put them into a big pot (not my good one because that was being cleaned) and started to boil it up. After it was done boiling and all the peelings where turning into mush I dumped it into an pillow case and hung it from the kitchen door. After I let it drain for a while I rung the rest out with my hands and the help of the kitchen sink. That black and white thing is the pillow case that is tided around the sink. After I got all the juice out I could I placed the pot back on the stove and let it simmer a bit. Well it was simmering I add a bit of sugar to it and then I put two canning jars into the oven to warm and placed lids and covers into boiling water. 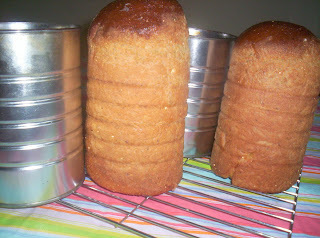 When the liquid was done I poured the juice into the jars and placed the lids on top. There was enough for these two jars plus a mug full. We did get to sample the mug of juice later that night after it cold. It taste like a fresh apple (should I be surprised). It wasn't sweet enough for hubby but I think that it will work out great for the cider recipe. I still have lots of apples left and we plan on going picking again next week. So other things I plan on making, I am sure I will post about them, include apple butter, pies, turnovers and crisp. Here are some recipes that I will be trying. This is a delicious recipe that I had laying around my recipe box. I don't really know where it came from or how I got it but I tried it out this week because we had a lot of tomatoes given to us. Its easy to make and taste so yummy. mix all together and enjoy with some Nacho chips. I have a question about fats. I know that there are good fats out there and bad fats, but what are they? And if I'm looking to buy oil how do I know which is the best one to buy when I am comparing labels? How much fat are we supposed to consume on a daily basis (I know that a totally fat-free diet is a no no)? Lets dissect this question just as it is written. First off you are right there are two types of fats saturated (this includes trans fats) and unsaturated fats (polyunsaturated and monounsaturated). Saturated and trans fat are the ones you want to look out for and consume less of. That is why Trans fats made it in the marketing world and now everything is TRANS FAT FREE. Research has shown that trans fat and saturated fats are not healthy for us to consume because when they enter our body they raise LDL (bad) cholesterol; increasing our risk for heart disease. Unsaturated fats are a healthier fat. Within this category of fats there are the Omega 3 fats. We (Dietitians) recommend more of your daily intake of fats come from unsaturated fats because they have heart health benefits and may improve your cholesterol levels. Reading the oil labels at the grocery store is always a head ache for me and I have boiled it down to this. The cheaper the better! hehehe...ok so maybe its not that simple. I tend to stick with canola oil; other better oils to stick with include safflower, flaxseed, sunflower, corn, olive and soybean and peanut oil. Other oils such as cottonseed, lard, palm, butter and coconut oil are ones that you want to stay away from because they are very high in saturated fat. On a food item to find out if its a "lower fat" product you want to check the % Daily value (DV). The %DV shows if there is a little or a lot of a nutrient in the product you are looking at. If % DV for fat is 5% or less it is a low-fat choice and for the saturated and trans fat together you want the % DV to be 10% or less. Fat free diets are a NO NO because fats are important for normal body function; they also provide energy, add taste and texture, make us feel fuller longer and help us absorb fat-soluble vitamins (A,D,E and K). Fat should account for 20-35% of your daily energy (calorie) intake. **Remember this is an approximation so keep in mind your own needs may differ. The one thing to remember is that Fat is Fat and no matter if its good fat or bad fat it is still adding calories into your diet. 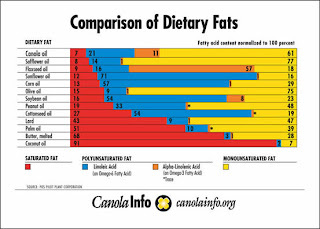 Be sure to consume fats in moderation; this can be easily done by following Canada food guide portion sizes. - The National Academy of Sciences. Dietary Reference Intakes for Energy, Carbohydrates, Fiber, Fat, Fatty Acids, Cholesterol, Protein and Amino Acids, 2002. Another week here already. Wow the weeks are flying by and like many other menu planners pointed out last week I am starting to want, what we call in our house, "warm fuzzy meals". Which means soups, stews and roast. But I think I will hold off just a couple more weeks since it is still pretty nice outside in the day times...last week it was even a bit too warm to have the oven on. This week there is something special with meal plan Monday. All participants are asked to share their family favorite recipe. Ours is Mexican Mesagna Hope you all enjoy!!! From now until Christmas we have a commitment at our church in the evenings which means we will have to eat on the run, literally. So I am wondering if anyone has any creative meal ideas for car driving? One mans junk is another woman's treasure!! I love keeping containers that food comes in. For one thing they are great (when washed out) to give away as gifts filled with treats. This way you don't have to worry about getting your containers back and you don't need to spend a fortune buying containers so you can give them away as gifts. This was my latest give away. This summer my mother-in law catered and used cherry tomatoes for her skewers. When she was done with the containers I packed them into my bags to come back home with me. I knew they would be great for putting some short of treat in. For this gift I lined the container with wax paper and placed the chocolate frogs in; layering a piece of wax paper between the rows. Then to cover over the large cherry tomato label I cut a piece of card stock, used a stamp and signed the middle. No these aren't mayo letters frying on the grill....although for a Hellmanns lover (like myself) that could be...wait a minute what am I thinking! hehe.. 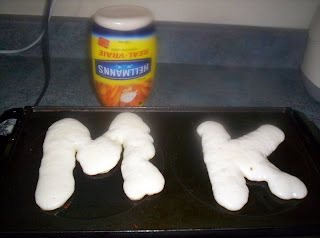 These are letter pancakes. I got the brilliant idea when I saw my brother in law do these for his kids. Although he is talented enough to pour the batter onto the grill into shapes and letters; I knew that I would need some help. So I dug through my, never through away container, cupboard and found this Hellmanns squeeze bottle. It was prefect! I simply poured the batter into the bottle then used it to make my shapes on the hot grill. This is a prefect way to let the kids help in the kitchen and could even get them eating pancakes, if they are picky eaters, and don't like pancakes. It has been shown that picky eaters will eat more when they have helped prepare the meal. So what are some fun ways you get your kids cookin in the kitchen?? It has been a total success. I got the recipe from Nikki and people are loving it. Its so simple to make and it's great to take with you to any get together. Also it freezes wonderful so you can have it on hand for when company comes over. If you have any recipes (cookies, loafs) that you just love and are your favorite to take out please send me the recipe or the link. Beans, Beans the magical fruit the more you eat the more you, we all know this classic school yard song or our family anthem on Saturday nights, all to well. So as you can probably guess this weeks question is about Pork and Beans. What are some good recipes (in the slow cooker) and how to keep the beans from going mushy. First let me start off by praising the bean!! Beans are so good for you as they are packed full of fiber, protein, folate and much much more. 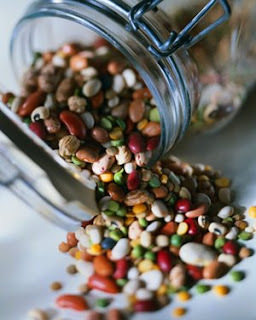 Eating well with Canada's food guide recommends that we should choose beans and lentils more often then high fat meats. Cooking the prefect pot of beans depends on two major things as far as I can tell. 1. Water: You must use enough water to cover your beans. Water or other liquid is needed to soften the beans as they cook. There must be enough liquid to keep the beans covered so they will cook uniformly. Any beans not covered during cooking will dry out and be inedible. The second thing about water is if you have hard water. Beans just don't do well in this type of water and its best to add about 1/2 tsp of baking soda to help soften the water. 2. Salt: There is a lot of different opinions on this one but salt should be added at the beginning of the cooking process. This will help bring out the flavor and also helps the beans to NOT become too soft. For average taste, 1 teaspoon of salt in the cooking water for each cup of beans is about right. You may want to hold off or cut down on the amount of salt used if salty meat is going to be added. ** A special note for this question since your hubby loves them in a tomato sauce. Tomato is an acidic food so its best to add this at the end of the cooking process. This will ensure you have the best pot of pork and beans. So try cooking the beans first then when they are almost done (1 hour left) add the tomatoes. I didn't see that there were any special instructions for cooking the beans in the crock pot. However it will take ALL day to do it so its best to have them pre soak before you put them into the crock pot. Be sure that if you are cooking them on high that you check them every once in a while to make sure that they are covered in liquid. Thank you to the people who have left questions. I am working on your questions so be sure to check back every Tuesday. 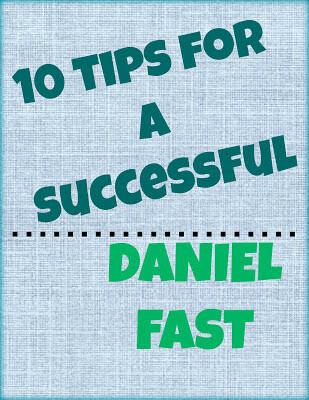 If you email me with a questions I can get back to you before it is posted on the blog. Now many of you reading this blog probably don't know how much in LOVE my hubby is with Google. He is always the first to try any one of their products and he is the guy who has been trying to convert our whole family over to gmail, google home page, picasa, notebook and google docs. He has been very successful in transforming us into a google family as he has always been right about their products. Before I was always using Microsoft word to store away any recipe, craft idea, or nutrition information I could find. Which in turn meant that maybe 6 times a year I would be searching for one thing and come across something that I had wanted to try 6 months early. Of course hubby was convinced that if I switched over to google docs all my sorting problems would go away and I would be able to recall a recipe I had wanted to try with in seconds. After about 3 months of convincing I finally let him show me how GREAT google docs is. So as of last week I became an official google gal...what does that mean you ask. Well I now have all my documents, recipes and spread sheets in google docs. I can't really go into details about how hubby got all my information from MW to Google docs because he is a computer nerd and well I am not that high tech. But I will let you know that it is wonderful to have all my stuff there. You see it has a great search feature that you just have to put in one word from the recipe and up it comes. This makes it so simple for searching your ideas that you have copied and pasted into it. Another wonderful thing about it is that I always have my recipes with me. That means if I am visiting friends and want to make a favorite recipe I can just go online and get my recipe!!! Below is a short video on how to use google docs. Last week I used google docs to put together two sets of list for my house binder. One is the Peterson favorite recipes, in this list is all the main dishes, sides dishes, soups, stews, breads, snacks,convenience foods and desserts that we love to eat. And the other is all the recipes (within the same categories) that I would like to try. Wait ladies (or gentleman) it gets better. The program allows for links which means for a recipe if you have it in your google docs or a website you can put the link right in. This has made this weeks meal planning so easy. I simply look at my lists and decided what I want to make and then I click the recipe name to see the recipe to find out what ingredients I may need to pick up at the grocery store. Oh boy I should have listened to hubby a long time ago. Also this program has made sharing recipes with you guys much easier as I just publish them as a website for you to see. For recipes that I am trying to make better and I can share them with friends to try and add their input. This program has also worked well with a grocery price spread sheet I created. Now I will have other people helping me put in prices so we will know where the best deal in town is!! Also ladies don't forget to check in tomorrow for You ask I answer Tuesday. And for more delicious meal ideas check out Organizing Junkie. 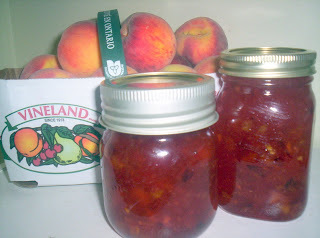 I have really been enjoying making my own jams this season. Already I have made strawberry, peach and blueberry jam. I do have to admit (although I haven't tried the blueberry yet) that the peach has been my favorite so far. The peaches this season have been deliciously sweet and they are also very nutritious. The contain essential vitamins and minerals such as Vitamin A,B, C, copper, magnesium, potassium and zinc. The process for making jam is very simple. 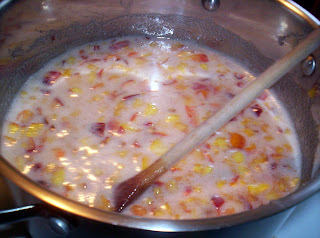 Here is a picture of my mixture just getting ready to boil hard for 1 minute. And here is the finished product. I really love the color of the peach jam. This batch turned out a little darker then the last batch but I am sure it is still delicious. I have heard that pear jam is very good. So now that they are coming into season I think I may try to make some. Let me know of your jam making skills and what types of berries and combination you use. Ok...so I want to start a new day on the blog. Its a you ask I answer Tuesday. Now that I am registared Dietitian I want to stay up to date on the latest information and I feel that doing a question answer day will help me be able to do that. So here we go if you got a nutrition question please feel free to ask and every Tuesday I will be posting answers to the questions. 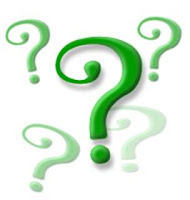 The questions can be about any type of food, nutrition related topic, or even cooking topics. To ask your questions please leave it in the comment box...also for clarification you don't need a blogger account to post comments you can just leave your name or do it anonymous. Hope to get lots of questions from ya! Last weeks meal plan went very well. Every thing I planned for we ate. I did try a new recipe last week Chicken Tetrazzini. The original recipe is from the happy house wife (link posted below). I didn't have some of the ingredients so I did some altering which is listed in blue. This is the sauce before I added the noodles. It was so delicious the best I have had and made. I have really been looking for a yummy white sauce dish like this. Its defiantly going into our family favorites! Sorry this picture isn't from the same night we ate it. I forgot to get a picture because we were so hungry and baby was crying. That always make for a fast supper, so this is my lunch the next day. I wanted to get a picture because I loved the look of the carrots in this recipe!! Hubby didn't even know there was carrots in it. He thought it was cheese that wasn't melting. For a better picture and the original recipe jump over to the happy house wife. Also this week I tried to make some bagels. I didn't think that they turned out that great because I had some problems with the bread machine and I didn't follow the recipe. I thought 3 cups of white flour wouldn't be good so I tried to add 1 cup of 12 grain flour. This made the dough very heavy. Needless to say I continued on with the project and got 7 bagels out of the batch. Hubby tried one this morning and actually like them. So I will have to keep trying...any advice?? Also this weekend we had some men over to help my husband build us a new deck. So of course I had to think of a meal that would feed them all. What better then a pot of chili (made in the crock pot allowing me to spend some gal time at the mall) and cornmeal muffins. The recipe I used for the muffins makes 24 large muffins and 12 small ones. They taste very yummy and not to sweet. I have always been making my own cards since the first time I went to buy my mom a mothers day card and saw the price on the back. Knowing that in a couple of months that card would be tucked away some where's, like in the bottom of the garbage, I decide to make my own. 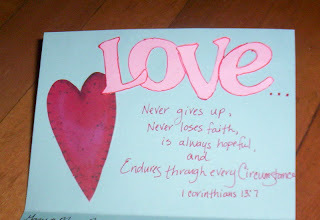 I must say that I have a long way from the folded over construction paper and crayons in my creativity. One way I have found to recycle cards that you receive is to cut out the images or saying and use them for your own cards. 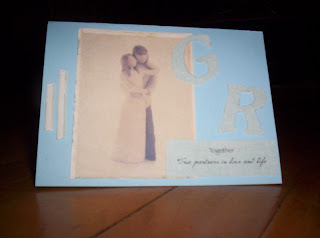 This is one that I just made recently for a wedding. I also love to make my own gifts to give people. From home baked goodies to cookies, brownies or soup mixes in a jar or even tissue paper wrapped bag of solider beans I like to give people things I know they love. Even sprucing up gifts makes them look so much more attractive. I got this idea from a friend at a baby shower I went to and decided to make one for my cousins baby shower. 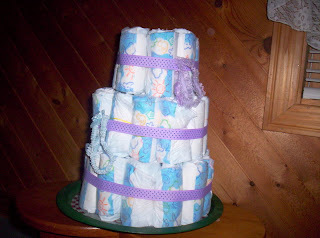 This is a pack of diapers formed into a diaper cake. Each diaper is rolled up and tied together with a mini hair elastic. Then you shape it like a cake, put some ribbon around each layer and place little gifts into the ribbon. Since this was for a little gal you could put baby hair stuff, mini books, teethers, soothers or whatever you would like. My friend used this gift as a baby shower game and had each women write their name and a number of how many diapers they thought were in the cake. The woman who was the closet won a little prize. Recently I have decided that before I have any more children I would like to learn how to do two things. The first is knitting. I am always seeing pretty little dish cloths at the farmers maker and craft sales and thinking...those would be a great gift. 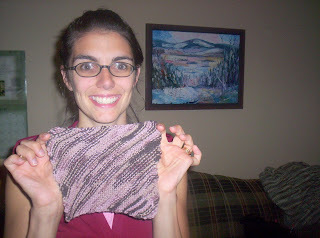 So with the help of 3 great teachers I have now knit 2 dish cloths and I am on the 3rd. This is a picture of my first one which I decided to keep because there are a lot of mistakes in your first project. My second goal is sewing...but I haven't started that one yet. For more frugal ideas visit Biblical Woman Hood. This is the newest addition to Kate's kitchen. I picked this up early this summer when I was home at my parents house. Mom doesn't use it too much so she asked if I would get any use out of it. Immediate I replied yes! It seems these gadgets are in a lot of my friends kitchens. I never thought I would enjoy the bread maker. I guess I felt it was a lot of flour for just one little loaf and most machines have a huge hole in the middle from the kneader. Luckily mom still had the instruction book with it and I found out that you can use these to just mix your dough!!! RIGHT ON in my mind. I mean I don't mind doing it but its great when you don't have to do it and make a mess all over the counter. So the first time I made the bread I just followed a recipe in the instruction book but instead of setting it on a basic baking selection I decided to put it on the dough cycle. Once it was done I took it out and divided it into two balls. I placed these into two small round coffee tins and let it rise. Once it was about double I place in the oven and baked at 350 for 40-50 minutes. The bread turned out great and tasted wonderful too. Especially when it was warm and smothered in peanut butter and molasses!! Today I was busy preparing for our weekend camping trip and was using the oven to make pita bread and granola bars so I decided to just bake the loaf in the machine. It turned out OK but not as nice as when I cooked it in the oven. And of course there is the hole in the bottom from the kneader. I think that I will stick to using the dough cycle. 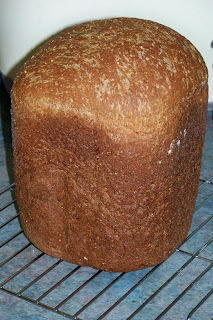 If you have any great bread machine recipes please post it or a link. layer ingredients as listed into bread machine. Select dough cycle to bake in oven or basic setting to make in machine. 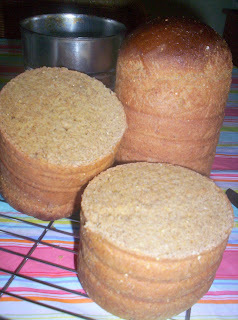 *one change that I made is that I didn't have rye flour or buckwheat flour so I just used 1/2 cup of 12 grain flour. We made it back from camping and wow did we have a great time. We were a little bit worried because the weather forecast was not looking great for this long weekend. But as a family we prayed real hard and stepped out in faith! The LORD is good we only got a little sprinkle of rain the second night we were there that lasted maybe 15 minutes. Other than that we didn't get one drop...and the best part is the friends and family who came to the camp site on Sunday to see us had both left their homes (which were on either side of us (one house ~ 45 minutes and the other ~ 1 1/2 hours) drove through rain and had thundershowers that day before leaving. Thank you God for once again showing us that you are in control! Thanks for all you ladies who commented last week and gave us some great ideas for a camping menu. Lets just say we didn't starve and probably could have stayed about 2 more weeks before all the food we brought would have been gone. This wonderful family I married into are high class campers (only when it comes to food...we sleep in tents). I will be posting about our meals and preparation later this week. As for getting a menu together here is what we will be eating this week. This corn meal recipe I got from a friend and find that it taste delicous. There are some varations written in it that she used and they still tasted great. I like to make this big batch and freeze them. The last time I made these they were crumbly but we just crumbled them into our chili. 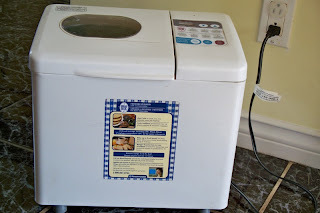 Also this week I am going to try making bagels using the dough setting on the bread machine and these tips.